the balloons. I found everything else in our resource room. Ah, the value of a well-stocked resource room. A thicker dowel to hang them from. 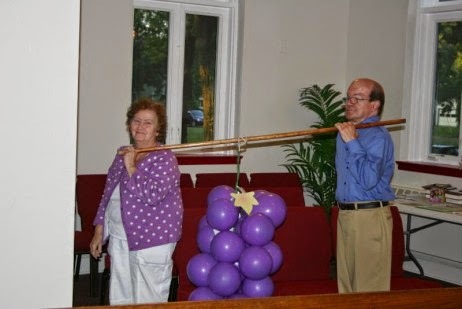 You could even use a broom stick handle or a shepherd’s staff from your Christmas program costumes. Thin wire (I actually used green twist tie that came in a 100 foot spool – but twist ties would work). Green pipe cleaners would even work. This is KidFrugal – you use what you have! Cluster of grapes wired together. Note long piece of wire allowed. Cut off a length of wire, at least 8-10 inches. If you are using twist ties, twist them together to make the length. Wrap one end around the tied off end of the balloon. Wrap the other end around the ¼ inch dowel. This dowel is going to act as your main stem. 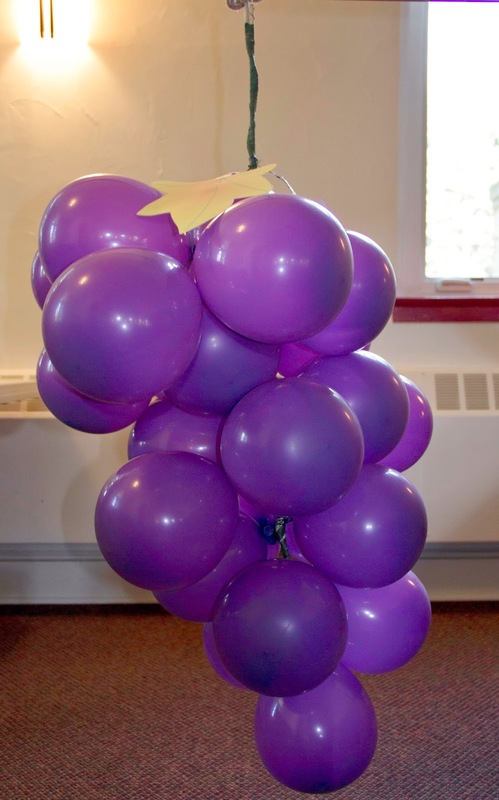 For the grape at the bottom of the bunch, wire the balloon on tight to the bottom of the dowel. As you work your way up, the clusters you make will need to be wired on with longer pieces, leaving more length between the dowel and the grape cluster. Tie three more grapes on above the bottom grape, a little further up the dowel, not quite as tightly. You want them to stick out a little further than the bottom grape. If you are going to use green floral tape to wrap the dowel in, it will be easier to start wrapping now. You can just keep working as you go up. After the bottom four grapes, you have to make “clusters” of grapes to put on (pictured). 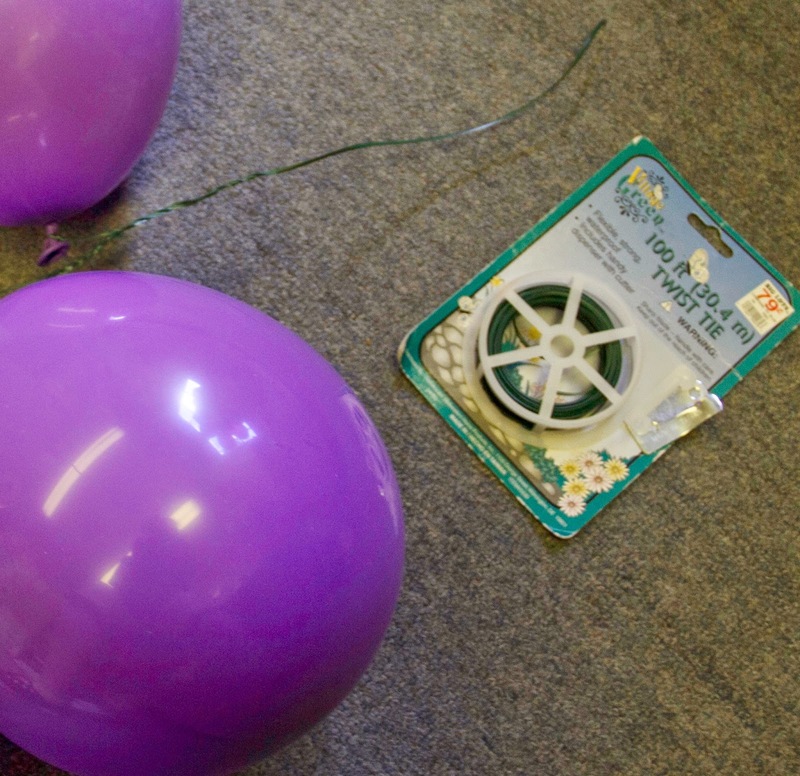 Just take two or three balloons and a LONG piece of wire.
. 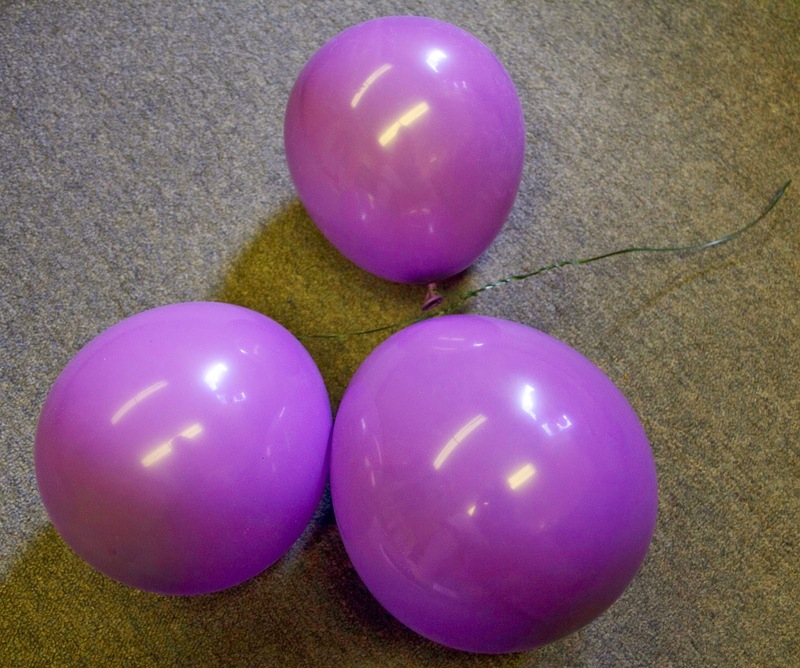 Tie the ends of three balloons together with the wire to make your cluster, leaving a good length of wire to attach the cluster to the 1/4 inch dowel (main stem). As you add clusters going up the grape vine, use longer pieces of wire leading out from the dowel. This way the balloons will stick out further than the ones below. Continue until you have the bunch as full as you want it. I continued wrapping the 1/4 inch dowel in green floral tape above the bunch of grapes all the way to the top. For the leaves I found some grape vine leaves in my clip art program and printed them up. You could also make several leaves out of green felt and use them. I only had time to print one leaf, but a few more might have been nice. The spies would have tied this giant cluster to their pole, so that is exactly what I did. Some nice twine might look cool, but no one is going to notice your string, they will be too impressed with the size of the grapes! That’s it – one giant bunch of Canaan grapes.